While a day of celebration for the Quinnipiac volleyball team was set to take place for Kat Miller’s senior day at the Burt Kahn Court on a Saturday Afternoon, the Canisius Golden Eagles spoiled any of these plans. The Eagles (15-11 overall, 13-4 MAAC) soared into the arena and outplayed the Bobcats (7-20 overall, 6-11 MAAC) in this contest winning in a convincing fashion, 3-0. The Bobcats did keep it close in the first two sets, losing by four in the first and two in the second. However, the last set the Bobcats made many mistakes and ran out of gas, losing by seven. The first set was tight throughout. Some great plays from Kat Miller and Lydia Jones of Quinnipiac and Cassidy Ceirani and Gabby Darnaby of Canisius on the offensive end influenced both teams trading points back and forth. At 16-16, the Golden Eagles put up two quick points that gave them a 18-16 lead, forcing head coach Kris Czaplinski to call a timeout. From there, The Golden Eagles never gave the lead back as they would work their way to a 25-21 first set win. The second set was similar to the first, except this time Canisius pulled away to a 22-17 lead. The Bobcats made a great effort to come back, tying the game 23-23 off a nice middle kill from Morgan Sherwin. Canisius was able to freeze the Quinnipiac run with a quick timeout from head coach Lenika Vazquez. Vazquez sure looked like a genius for her strategy as they would go on to earn the next two points stunning the Bobcats with a 25-23 set win. 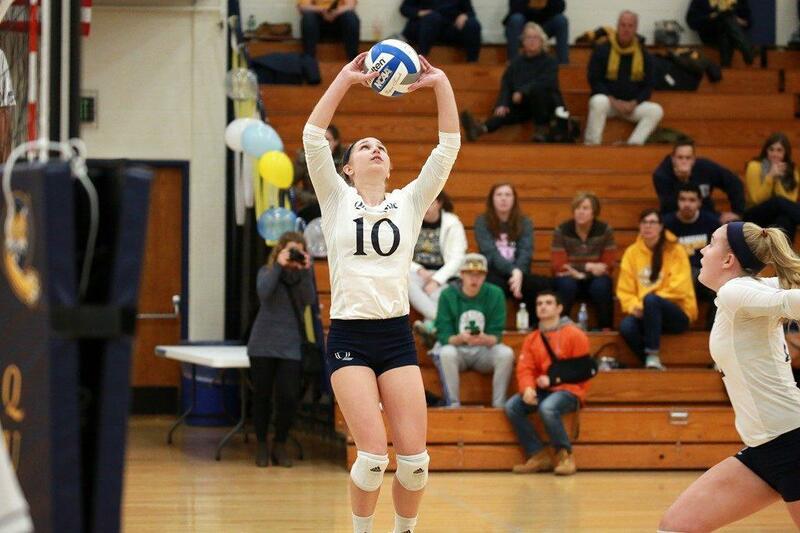 A crucial mistake was made when the score was 24-23, as Quinnipiac Freshman defensive specialist Daniella Balsano failed to make a proper serve receive pass to setter Maria Pansari resulting in a Canisius ace to win the set. Mistakes like this one were critical in the tough and close sets the team lost. The third set showed that the Bobcats simply ran out of gas. The defense and offense of the Golden Eagles simply tired out them out towards the end, resulting in 25-18 final. Despite of the loss, Kat Miller had a solid performance on her senior day. She tied as the team leader of kills with 10 on the day and also contributed two digs on the defensive end. When asked on what Kat Miller did for the team across her years on the team, Coach Czaplinski mentioned several things. In terms of play he describes Miller as a coach’s dream, being a player who can do it all on the volleyball court when it comes to serving, setting, digging, and hitting. With the very limited amount of time that Miller has as a volleyball player for Quinnipiac, she will look to lead the team to a victory in their final match of the season at home against Niagara this Sunday at 1PM before beginning MAAC tournament play.